As the warm weather starts to melt away, I find it so satisfying to bring a hot and hearty lunch meal to work. This dish is easy to mass cook and a couple of portions are easily frozen for another time so you don’t get tired of it. A great mid-day pick me up! Ingredients are simple, whole and healthy. Enjoy! Add onions, cook until soft and they start to turn brown (about 7 – 10 minutes). Add garlic, cook for another minute or so. Add the tomato paste, chili powder, cumin, oregano, garlic powder and onion powder, cook for 2 more minutes stirring constantly. Add tomatoes, liquids, beans and sweet potato, stir until combined. 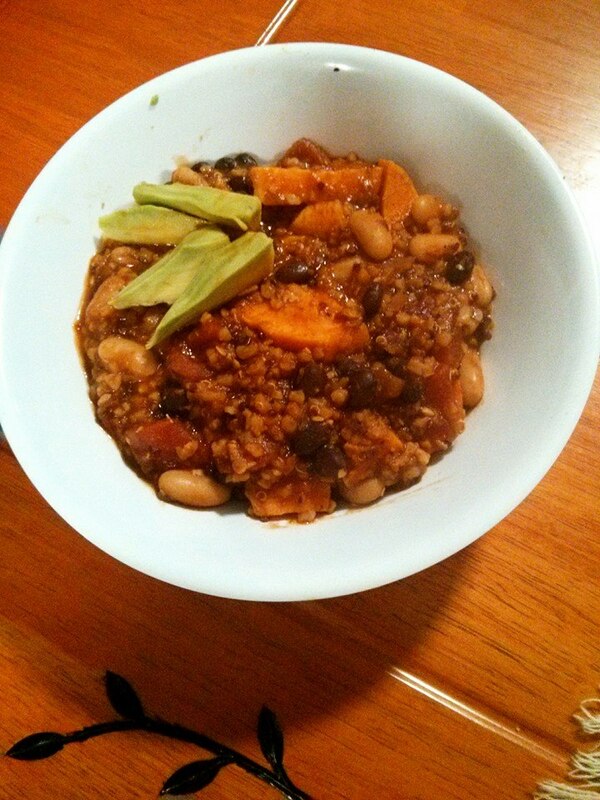 Chili is ready when sweet potatoes are tender. Add additional water if chili is too thick for your liking. Next Cuckoo for Coconut Oil?